When I think of Midsummer, images of bonfires and solstice celebrations spring to mind, followed by the symbolic Mediæval custom of paying a red rose “in the time of roses” on Quarter Day, but today I am remembering a less uplifting event, following on from cannon-fire and the red of blood – the Surrender of the City of Oxford during the English Civil War, on 24 June in 1646 – and one besieging Parliamentary soldier who did not live to see the day. 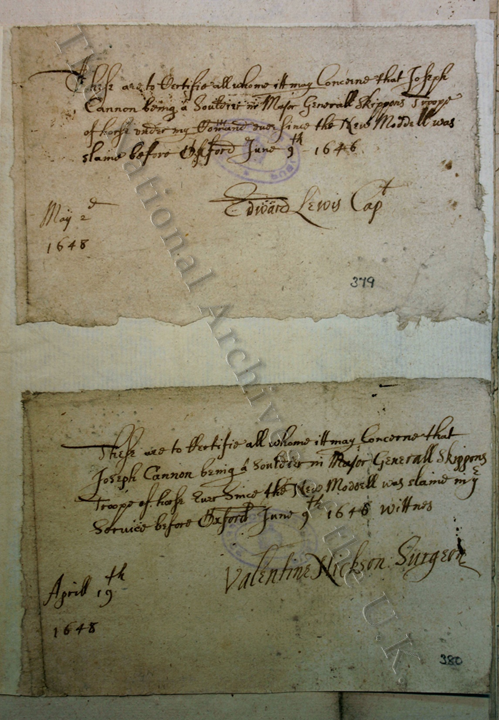 Respectively writing on 19 April and 02 May 1648, Surgeon Valentine Nickson and Captain Edward Lewis use identical phrasing – down to the spelling – “to Certifie all whome itt may Concerne that Joseph Cannon being a Souldier in Major Generall Skippons Troope of horse” “euer since the New Moddell was slaine” “before Oxford June 9th 1646”. Although Joseph himself has left no footprint in the indexed national historical record, with the New Model Army having been formed in 1645, we know that as a soldier in Philip Skippon’s Troop he would have fought in the Battle of Naseby before his death the following year during the third Siege of Oxford, while the Treaty which eventually issued in the Royalists’ surrender of the city was being negotiated. Two weeks too late for Joseph, but thanks to The National Archives providing readers with a means for ‘tagging’ catalogue descriptions, his family’s descendants can now locate his appearance in these State Papers at the bottom of the page, and his service has left a footprint after all.